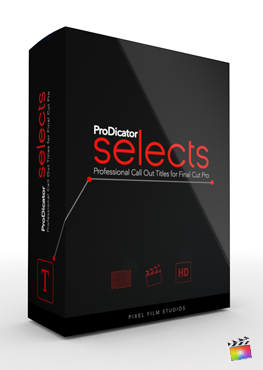 ProDicator Selects is a collection of 30 self-animating call outs created exclusively for use in Final Cut Pro X. Each preset is professionally designed with built in Motion tracking, customizable text, and elements. Type in your own text, change any element’s colors and even choose new animations using drop-down menus. Save time and money editing with ProDicator Selects from Pixel Film Studios.